Prague tram network is one of the largest in Europe. Trams offer a comfortable and reliable surface transportation in Prague. Daily tram lines 1–26 operate approx. between 5:00 and 24:00. Intervals are 8 minutes at peak times and 10–20 minutes at other times. The busiest lines 9, 17 and 22 operate more frequently (every 4 minutes at peaks, 5–10 minutes otherwise). Check the tram timetables to find the departure times or see other traffic maps. 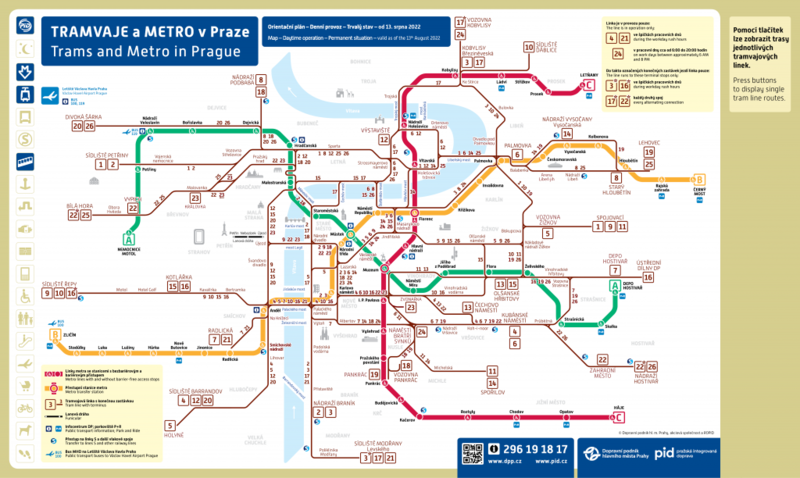 All tram lines are operated by the Prague Public transport Co.
From 25th March 2017 a new tram line number 23 operates in Prague. The whole line is served only by the oldest type of T3 trams, which should have left all other tram lines on the same date. The line is operated during the whole year. Its main purpose is firstly to preserve this legendary and very popular type of tram T3 and secondly to lighten the busiest Prague tram line 22 mostly in the section between the city center and the Prague Castle. New line 23 is operated on the following route: Zvonařka – I. P. Pavlova – Karlovo náměstí – Národní třída – Národní divadlo – Újezd – Malostranská – Pražský hrad – Pohořelec – Malovanka – Královka. The range of operation is approximately from 8:30 AM to 7:00 PM with the 30 minute interval. During the main tourist season on the weekends the interval is shortened to 15 minutes. All regular PID tickets are valid on this line. Timetables can be found at stops or online. Night tram lines 91–99 operate approx. between 0:00 and 5:00 in 30 minutes interval. At nights friday/saturday and saturday/sunday the interval is shortened to 20 minutes. The station Lazarská is a central transfer stop where all the lines meet. See timetables of night trams.